The number of skin cancers in the UK is not accurately known as numbers of the most common type of skin cancer Basal Cell Carcinoma (BCC) are not recorded. It is estimated that there may be 300,000 BCCs treated in the UK each year. BCC do not tend to spread to other parts of the body, but need treatment as will otherwise continue to grow locally. Squamous Cell Carcinoma (SCC) of the skin are less common than BCC, but are more dangerous and resulted in over 600 deaths in the UK in 2012. Melanoma is much rarer with ~13,300 being diagnosed in the UK in 2011 and over 2,100 deaths from melanoma in 2012. Kaposi’s sarcoma, Merkel cell sarcoma, and cutaneous T-cell lymphoma (of the skin) are other less common types of skin cancer. It’s important to see a doctor if you are concerned about suspicious or changing skin lesions or growths. Your Harley Street Dermatologist will examine the affected area with a dermatoscope, an instrument that allows up-close observation and monitoring of the skin lesions. Dermatoscopy is an important aspect of diagnosing skin cancer. Images can be stored for future reference . 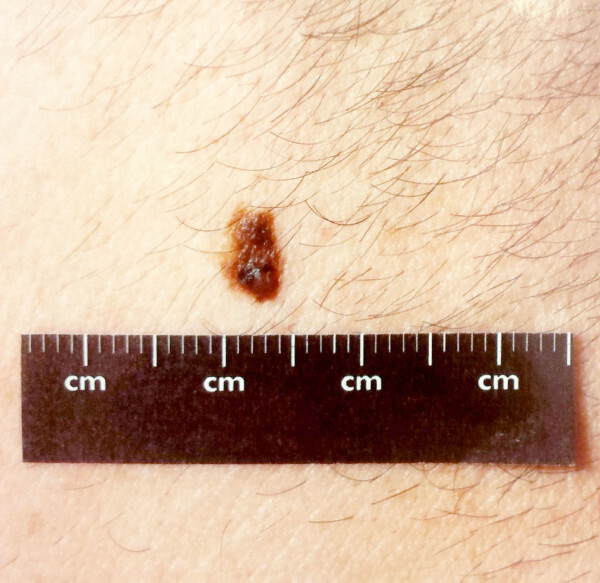 An image taken during the patient’s current visit is compared with previous images to assess the progress of the skin lesion suspected to be cancerous. Skin examination may be insufficient for an appropriate diagnosis as even with dermatoscopy it is not possible to determine whether a skin lesion is cancerous. In this situation a prompt skin biopsy may be ordered. This usually involves removing the suspicious lesion or mole entirely. The dermatologist will then send the sample to the lab where a pathologist will examine it under the microscope. Follow up depends on the type of skin cancer. Doctors do not normally ask for further screenings if a basal carcinoma was fully re moved unless the patient is at particular risk of developing other skin cancers. However, regular follow up is routinely recommended for patients who have had an SCC or melanoma. This is to monitor for recurrence of the original skin cancer and check the rest of the skin to exclude development of new skin cancers. The majority of skin cancers are treated by surgery to remove (excise) the tumour. However in certain situations doctors employ different methods to treat skin cancer, this is especially true in superficial, early or pre-malignant lesions. The type of treatment varies from patient to patient and depends on the stage and type of the cancer growth, its size, biopsy findings, and location of the cancer. Hence, discussing your options is vital to successful treatment. Treating advanced skin cancer involves a team of medical professionals, which includes a dermatologist, surgeon, chemotherapy specialist, radiologist, and pathologist. Surgery – Surgical removal of the affected area is a straightforward means to remove cancerous tissue, thus preventing possible growth and spread. Topical therapy – Your dermatologist may prescribe a cream for Bowens disease (squamous cell carcinoma – in situ) and superficial basal cell carcinomas. Cryotherapy – Exposing cancer cells to liquid nitrogen can destroy them. This method is effective for superficial BCC and sun damage. Photodynamic therapy – This makes use of special type of light aided by a photosensitising agent to destroy cancer cells. Radiotherapy – This may be necessary after surgery when deep tumours are suspected.